a fitness minute: Could A Stomach Pacemaker Be The New Weight Loss Tool? Could A Stomach Pacemaker Be The New Weight Loss Tool? 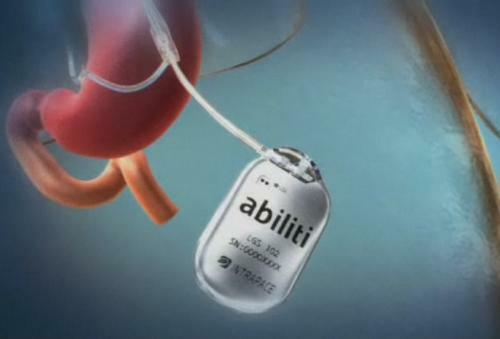 The company Intrapace, has created an innovative stomach pacemaker, called Abiliti, aimed at curbing appetite and controlling weight. According to the company the device is implanted in the stomach during a one hour laprascopic procedure. Once in place, the device uses its food detection sensor to sense whenever the patient eats or drinks. This prompts it to emit low energy electrical impulses to nerves that trigger a feeling of rapid fullness. As a result, patients eat less than they would normally. Thus far, one trial study of 65 patients has been completed. After receiving the device, the participants lowered their daily food intake by 45% and loss 22% of their weight within a year. One participant described the implanted stomach pacemaker this way: "It feels like a little pressure on my stomach, but it's not bad." The procedure costs about $24,000 and is available in Britain. It is expected to be available in the U.S. by 2014. Read more about it here.